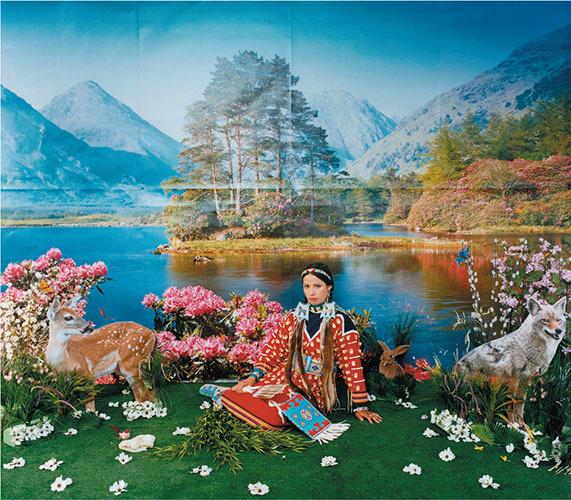 Memories of the Howdy Doody Show and Princess SummerFallWinterSpring fill my brain as I gaze at Wendy Red Star’s “Four Seasons Series” – four large digital images of the artist satirically posed before artificial landscapes she has created akin to the Museum of Natural History dioramas, but reminiscent of Native American associations. These four works are part of an incredible exhibit at the Metropolitan Museum of Art. In “The Plains Indians—Artists of Earth and Sky”, one can view from March 9 to May 10 the historical with the contemporary – an outpouring of art by Native American artists and artists of Native American descent. 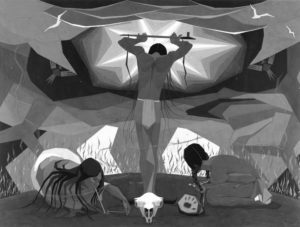 Many of the contemporary pieces in the exhibit deal more explicitly with the “white man’s” treatment of Native Americans than do the historical examples. 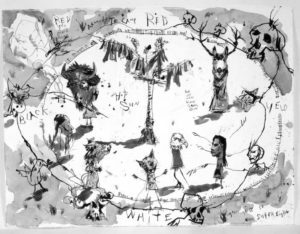 For instance, white man’s “gifts” as shown in Jaune Quick to See Smith’s mixed media work “Gifts for Trading Land with White People,” a 14 ft. x 60 in. mixed media painting with objects. And Edgar Heap of Birds’ enamel on aluminum piece (“Ma-ka-tal-na-zin”), made in 1990, which commemorates various Dakotas put to death. It is one of 40 commercially made signs that resemble nothing more than license plates of cars. Four Seasons Series, 2006 (Spring) Wendy Red Star (1981 -) Crow, Billings, Montana, Archival pigment print on Muesco silver rag on dibond 35.5 x 37 in each panel. Collection Nerman Museum of Contemporary Art, Johnson County Community College, Overland Park, Kansas. This is an exhibit unusual for the naming of individual artists, past and present and the treatment of the art and the installation as if it were all Fine Art and thus, helping us to see the objects in that way. 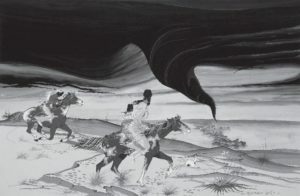 The primitive, shamanistic and aesthetic skills of historic Native America artists are shown in conjunction with the art of contemporary artists of Native American descent whose art deals with politics in its self- referential aspects– aspects that affect and influence their artistic interpretations of their history, their experience of living, their heritage today and yesterday. 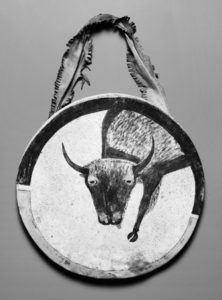 The Metropolitan Museum show is divided into eight sections, with a focus on a chronology of objects reflecting ideas and events that affected the lives of Native Americans. From prehistoric times to “Life on the Great Plains” to “Death of the Buffalo” to the final section focusing on art by contemporary artists of Native American descent, the design of the show helps one better understand the tragedy in all that was destroyed and yet see the art that was saved by the oppressors, having often been given as gifts of pride. The art of Plains Indian from the historical past to the contemporary present is included in this remarkable show, but I couldn’t help but select my own favorites. I loved seeing the ledger art- pencil drawings on lined notebook paper, but I was saddened to learn that the paper and pencils were gifts from European Settlers who then took the drawings and later bound them into sketchbooks. 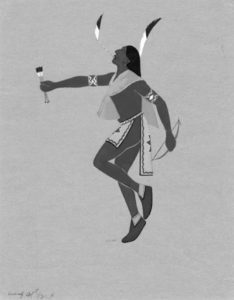 Black Hawk, a Lakota Artist, was paid fifty cents a drawing and some Native Americans sold their drawings for $2 each on the streets of St. Augustine after many had been taken there in an effort to assimilate and “educate” them. Still, seeing their drawings of daily life next to those of their shamanistic rituals and the belief in the power of nature held at that time is extraordinary. This exhibition is a fascinating mixture of past and present with the sense of autobiography coming through the honesty of the voices in all the work. Other favorites of mine included Rebecca Blackwater’s ca. 1915 quilt of animals, objects and people stitched onto a black cloth background, a pair of beaded shoes ca. 1920 and a drawing of “A Man Receiving Power from Two Spirit Animals” by Wohaw, ca. 1877. Though the Met has an outstanding presentation of the objects on the museum website, try to see the show in reality to get a sense of the objects themselves. The roughness of the leather that was stripped from the animals and tanned, yet drawn on so delicately and spiritually is important to experience; these qualities are not visible in the digital images of the art. Curiously, the historical examples of real life objects of use- moccasins, pipes, and garments theoretically for everyday use, are incredible examples of art with aesthetic considerations as strong as the sacred. 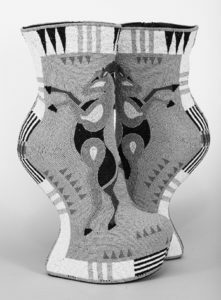 Finally one of the most impressive works is a contemporary ceremonial garment (2005) – digitally designed with Adobe Illustrator by Jodi Archambault Gillette, a Lakota who is Special Assistant to the President for Native American Affairs—a diplomat, an artist, a dancer who, when she performs, perhaps sends the strongest message of all about the importance of art in our Twenty-first Century world. by Mary F. Holahan Ph.D.